I am an adventure-adrenaline junkie. Okay, let's amend that: I am an adventure-adrenaline junkie....from the comfort of my couch. In other words, I love true adventure books. Especially ones about mountain climbing. I have no idea where this love came from given that I've never climbed a mountain in my life, nor do I intend to. I've even been known to avoid small inclines while taking a stroll around the neighborhood. Reading about these adventurous souls who tackle the world's most dangerous peaks, however, stirs something in my soul. Probably a little smugness that I'm not the one who fell down an icy crevasse in sub-zero temperatures and ended up a frozen mummy abandoned on a mountain side. Whatever the reason, a well-written climbing story will always find it's way onto my bookshelves. This summer, the book I couldn't resist was Andy Hall's Denali's Howl, the riveting story of the ill-fated 1967 Wilcox Expedition on North America's tallest peak, Denali.Formerly known as Mt. McKinley, Denali dominates the Alaska Range. At 20,237 feet high, Denali isn't the highest peak in the world, but the climb from the base of the mountain to the peak is 18,000 feet and that is the largest of any in the world. In July of 1967, twelve young men set off to conquer Denali. Most of them had enough climbing experience that it should have been a routine ascent. They had planned and conditioned themselves for this climb for months and months. What they hadn't planned for was an unforecast super-storm that bore down on the mountain just as the Wilcox Expedition was approaching the summit, trapping them in far-below freezing temperatures and hurricane force winds in the matter of minutes, conditions that continued for ten days.Of the twelve men who left the base of Denali, only five were to return. What happened up on the summit of that mountain has been shrouded in mystery for over forty years. Reluctant and conflicting accounts from the survivors over the years have only added to the confusion as survivors and those who watched from afar passed around accusations and blame.Alaskan author Andy Hall's account of that fateful expedition is masterful. Despite his obvious meticulous research he never once allows the narrative to bog down with onerous details. Facts are presented where known and where they aren't, Hall provides plausible scenarios based on the evidence that is known. He provides first-rate biographical background on each member of the expedition, making it easy for the reader to keep track of each team member as the doomed party makes their way unknowingly towards disaster. Throughout the fast-moving narration, he also intersperses an excellent geological history of the imposing mountain as well as the fascinating climbing history over the past one hundred years.Overall, Denali's Howl is so well-written it certainly rivals Jon Krakauer's blockbuster climbing hit Into Thin Air. If you enjoyed the one, you'll certainly appreciate the other. As the most deadly climbing accident ever on Mt. McKinley (aka Denali) this story has been written before, and I’ve read four versions, but none match Hall’s treatise. With seven bodies still snow-bound somewhere on the mountain and the details of their final days unknown, mystery still surrounds the catastrophe.On top of mystery of the climbers’ final days and whereabouts, there was ensuing controversy regarding responsibility for the rescue effort. Could the climbers have been saved? By whom? Errors were made, but of what significance? This is a story about extraordinary men in an intense environment where minor mistakes can have deadly consequences. Hall supplements the events on the mountain with interviews of the surviving climbers, with professional guides, with rescuers and with meteorologists. All this expertise aside, the funnest insights are Hall’s own. He was at McKinley Park during the climb, albeit only 5-years old, and his recollections from childhood add a Scout-Finch flare to the narrative. This is an interesting read, because you know what happens, but you're reading it for the details. There are a lot of characters, and I sometimes have a hard time keeping them straight. The climbers were around the age that my oldest son is now, so I thought a lot about how hard it must have been for the parents of these "children", knowing the risks an expedition like that could bring. My own son says "Mom, I'll be fine!" whenever I have concerns about the decisions he's making, but he's an adult now, even if he'll always be my baby. I can't imagine that parental worry becoming a reality. I chose to read this because my younger sons's high school marching band is doing a show based on this book and I love to know the details. I can't wait to see the show. They are working so hard on it. I'm sure they'll represent the book perfectly. Also, this book is not as long as it seems. Probably the last third of the book is pictures and notes. Denali’s Howl is gripping, harrowing nonfiction account of a 12 man expedition to reach the summit of Mount McKinley in 1967. Formally called Mount Denali, it is the tallest mountain in North America. Although 12 went up the mountain, seven never returned. This is the account of what happened and the “perfect storm” that descended on Mt. Denali that sealed the climbers’ fate.I found this book very informative and fast moving. I don’t know anything about mountain climbing but I found this very easy to read. Enough facts were provided that I could understand what was going on but I didn’t get lost in details. I wanted to keep reading to find out how and why the catastrophe occurred. I appreciated the author’s knowledge and delivery of the subject. The only thing I found confusing was keeping track of who was who. This was by no means the author’s fault though since there were 12 climbers and he allowed you to get to know each one.I highly recommend this book to anyone who loves to read nonfiction. It is very enlightening and you don’t have to be a mountain climbing enthusiast to find it interesting and compelling. You will start the story and not be able to put it down till you turn the last page. Denali's Howl was a perfect storm--today's meteorologists who sat down with their computer modeling and the author explained it as a once-in-a-100-year collision of extreme high and low pressures over Denali in July 1967. An expedition of twelve young climbers was at or near the summit when the storm hit. Andy Hall was the five year old son of the Mount McKinley (Denali) National Park superintendent and was deeply impressed by his father's involvement in the tragedy. Nearly fifty years later, he has done a great job piecing together the written records and interviews with the survivors, other climbers, and experts. He portrays the personalities, the necessary but awkward melding of two different climbing groups, and probable weaknesses and mistakes. But in 1967 communication was primitive and search and rescue just starting as a discipline. Hall tells stories of some more recent experiences with storms on Denali and shows how even with modern techniques, humans are frail and limited in the face of such an overwhelming force of nature. This is a very methodical attempt to lay out everything we know about a doomed group of climbers on Denali in 1967--one can imagine that if one were very into mountaineering and had heard lots about this incident already, one would greatly appreciate seeing all the known evidence combined with the memories of an impressive number of the people involved. Since it's clear a lot of blame was thrown around both in the immediate aftermath of the tragedy and in the decades since, I think it's good that this book now exists as an attempt to sift through everything to separate out what we can definitely say happened from what we can only speculate about.However, as someone coming to the book with no prior knowledge of the incident, I found Hall was mostly lacking the storyteller's spark that could have made this a truly gripping read for me. (With the exception of the Prologue, which is fantastic.) I got bogged down in all the details and it took me about two and a half weeks to read a book that's really only a little over 200 pages without notes. Hence the 3 star rating. Whatever you do, do not listen to the audio book of this. The narrator sounds like John Wayne on a massive dose of Valium reading a phone book. Also, many of the names of mountains and sherpas were overdubbed as if, after it was all recorded, the producer learned that the narrator didn't pronounce the names correctly. I'd give it 6 if I could. A good, solid telling of this ill-fated attempt at climbing Denali. First, big big thanks to Matt and Jess Norcross, owners of the independent booktore McLean and Eakin in Petoskey, Michigan. This book was listed in their Bookseller Recommendation session at a reader's retreat and was enticingly described. I was riveted to the crazy idea that 12 people would seek an adrenaline high by climbing Mt. Denali in no more than the weekender camping gear available in 1967. Many of them were students, and barely had the money to buy necessities and equip the car with supplies and gas needed to drive the hundreds of miles to reach the mountain base. The author is a journalist who was a small boy at the time of this tragedy. His dad was the park superintendent in Alaska. Andy Hall remembers riding around with his unusually somber father in the truck as he was trying to save the remaining climbers that fateful July.I feel weird giving a book like this a star rating. We get a lot of necessary geographical facts, biographies of the climbers, and mind-boggling statistics on the extreme weather systems that collided to produce a super-arctic storm that had been previously unrecorded. I applaud Andy Hall for his telling of this tragedy. A book like this can be easily sensationalized for sales reasons, but he provided an unbiased account based on radio transmissions, agency records, and extensive interviews. He honestly admits when there are conflicting accounts of one situation. He presents the various statements, and will occasionally remark if one was plausible considering the conditions and supplies available, and moves on- stating simply that it's impossible to know for sure. Some things must remain a mystery. Occasionally, truth is found. In one case, a climber was obviously lying by stating a pressure release valve malfunction on a stove was the reason for a cooking fire. The model didn't even have a pressure release valve. Oops.This story is a scary reminder of the force of human nature. At the end of the day, regardless of preparation, if the force is against you..not a lot can be done except hunkering down (if possible). In this case, the sheer brutality of the winds and temperature- sustained not over the course of a few hours but a full week, became insurmountable. Rescue planes that needed to make tight turns for crevasses while carrying additional supplies were grounded. This is an epic adventure story that will make you want to stay inside this winter (if you have my temperament at least!). This mission helped bring about important changes in rescue organization, radio communication, and requirements for climbing applications to be approved. I enjoyed that Andy Hall caught up with the survivors close to publication and gave an update on what their lives became after this harrowing event. Great, great nonfiction. In the summer of 1967 Joe Wilcox, a university student, leads an expedition of 12 men to climb North America’s highest peak – Denali (also known as Mount McKinley) but tragically only 5 come off the mountain. Although a child at the time of incident, Andy Hall’s father was Mount McKinley National Park’s superintendent during the period and Hall is therefore able to combine personal recollections, National Park logs, letters, and journals to examine the events surrounding the tragedy. Even knowing how the tale would end, I quickly become engrossed in Denali’s Howl and did not want to put the book down until I knew how the story unfolded. Hall recounts the climbers fatigue, bickering, and mistakes but places it all within the context of climbing expeditions of the time. The tone of the book varied between a historical narrative recounting and a journalistic report which at times I felt interrupted the flow of the book. But this style allowed for a balanced review of events without putting words into people’s mouths. Until obtaining a copy of this book, I had little knowledge of mountain climbing but I still found story easy to follow with equipment, terms, and the environment of Denali. Keeping track of who is who maybe the most confusing part of the book but Hall’s careful introductions of the large number of people involved in the incident - from the 12 members of the Wilcox expedition to the members National Park service and those involved with rescue attempts – helps to reveal and decipher the individual personalities. Overall I would recommend the book to anyone who enjoys non-fiction adventure stories.I received a free ARC of the book through First To Read. Ok. Andy Hall's Denali's Howl kept my interest but the limited firsthand accounts weigh on the book throughout. A slim and grim narrative, it added to my almost non-existent of Denali but disappointed generally. Writing about a mountaineering tragedy 50 years after it occurred with limited sources would be a challenge for anyone let alone a first time author. Hall does an adequate job but seems to include every anecdote or piece of dialogue about the '67 climb he could obtain. Some of the most interesting pieces of the book are the chapters that do not deal with the 1967 climb, and Hall would have been well served to spend more time sussing out other available stories - more about the history of climbing Denali, more background about the climbers, maybe even more about his relationship with his father, the superintendent of Denali (f/k/a McKinley) National Park at the time of the climb.Several other books have been written about the '67 climb, including one by a surviving climber. Not sure I will seek those out given how depressing this story is and how little other information about the climb I expect may be available. If you are looking for a book about the '67 climb, I suggest you cast a wide net, but Denali's Howl is not a bad place to start. Recommended for the insane considering climbing Denali. Ok I listened to this book on a recent motorcyle camping trip filled with many memorable moments. One that I cherish is after making camp just ahead of a terrific thunderstorm I lay on my cot and listened as rain lashed my tent. I love mountaineering tales. The crampons, the seracs, the diamox and couloirs all leading to the crevasse , hypothermia, HAPE and assorted frostbite. This is written by the son of the head ranger on what what then called Mount Mckinley who was a kid, vaguely aware of the horrors transpiring 20,000 feet above. There has apparently been a lot of controversy and wrong assumptions that the author sets out to quell and correct.He interviews many of the survivors often getting conflicting accounts and makes a very strong case that while mistakes were made by both the climbers and the responders in the ultimate analysis it was the weather that did them both in. I won this book in the Goodreads giveaway and must say it was a pleasure to read. 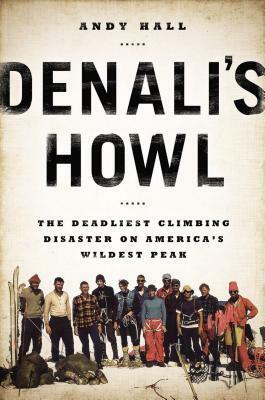 Denali's Howll is the story of a twelve man expedition that attempted to climb Denali (Mt. McKinley) in 1967. Only five of the men were to return. This book is a fascinating account of what happened during that expedition and the perfect storm that raged on the mountain for a week. Even though you know the outcome from the first page, the writing keeps you glued to the edge of your seat and unable to put ithe book down. Andy Hall does a great job relating the facts and revealing the climber's personalities. Denali is a spectacular sight but this story reminds you that nature is ultimately the one in control. I wasn't a huge fan of the narrator on this one. His tone was a little dull, and I found my mind wandering more than once. I did enjoy Hall's comprehensive review of the 1967 climbing disaster on Denali. Information is far less prevalent for mountains not named Everest, so I appreciated the comprehensive review of the mountain, the time period, and the climb. It's also fairly cool that Hall and his father were tangentially related to the events in the book; there is some controversy and criticism tied to the climb and the story feels more legitimate from this perspective. Not my favorite climbing book, but a good look at domestic climbing on America's highest mountain. Well done account of a tragic climbing disaster on Denali in 1967 ... 11 went up but only 4 came back. Solid research and clearly written. My only quarrels is a lack of good maps of the mountain and the assumption that a reader is versed in the technical aspects of climbing and equipment. Denali’s Howl was one of the books that I picked up while on my vacation in Alaska. I had just spent the day touring through the beautiful Denali National Park and was browsing through the gift shop. I knew I wanted to pick up something about the mountain itself because we had been unable to see it due to weather (did you know only about 30% of visitors to the park actually see the peak because of the weather?). As you may know from having read some of my other reviews, I’m drawn to books, particularly non-fiction, about disasters. Denali is a dangerous mountain to climb and there have been a few disastrous moments in the life of the park, however, none is more notorious than the 1967 Wilcox Expedition where 7 of the 12 men died up on that peak and have never been recovered.Andy Hall brings a unique perspective to this book that isn’t present in others about this event – he grew up in Denali National Park and his father was the Superintendent of the Park at that time. While he was only 5 years old, so he didn’t know the gravity of the events unfolding at the time, he has an “on the ground” connection to the story in a way that most others don’t. He can speak to what stresses it took on his father or why he made the choices he did. However, the book never came off as feeling like he was trying to whitewash over the culpability of everyone involved despite his close association with it.Although the book is shorter in length than most on this subject, I found that it had enough information to meet my needs. It covered everything from the history of climbing of this mountain, the meteorology of the storm that hit it, the difficulties of climbing any mountain (but especially Denali) at that time, the backstory of each man in the Wilcox Expedition, the climb and attempts to save the men, and the fallout from this disaster. I didn’t feel that there was any glaring gap that I wished to have had filled. There were a few moments that felt bogged down a little bit with information that I didn’t understand about climbing in general, and a couple moments that felt repetitive, but neither of these elements changed how I raced through the pages. While not exactly a narrative work of non-fiction, there were certainly moments that felt that way, particularly the climb and the rescue. The details that are known are sometimes sparse or sketchy, they have only the recollections of the men who survived and sometimes their stories didn’t align possibly due to the impact of the event or just the weather and nature of the climb on them. Additionally, they don’t have any idea what actually happened to the men that were lost because none of the survivors were with them at that time and some of the men were never located; at best they can speculate.This book would appeal to a lot of different audiences: those who want to read about disaster or natural events, those who are avid outdoorsmen/women or climbers, those who want to know more about Alaskan history. The book reads quickly, but packs a punch in those few pages and leaves the reader with an impression of how dangerous mountain climbing in general, and Denali in particular, can be. Oh, and lest I forget, the paperback book includes pages of photographs, some from the climbers of the Wilcox Expedition which show some of their progress. These were chilling at times to think that these were the last photos of some of the men that were lost, but I was grateful to be able to have a visual experience as well.This review was previously posted at The Maiden's Court blog. The author has done a good job of researching the events that happened in 1967, and there is a lot of information in regards to the Wilcox Expedition's planning, approach, and ascent to their two higher camps, and the summit success from the first group. There is also a great deal of information on the rescue from various points on the mountain in regards to what was happening while the storm was going on at the high camp. But I would have liked a little more summary at the end of what people thought had happened in regards to the weather, and what experienced mountaineers might have done in that situation, or how the elements might have stripped them of their common sense in regards to the actions they may have taken. Not so much speculation as to what happened to each person, as we will never know without finding all the bodies, but having the comparison to another expedition gave me more insight as to what was happening on Denali during that time, and I would have liked to have more of that. He also mentions a wind replay on computers that he has seen, but it was hard to picture it in writing. I'm not sure if pictures would have assisted.I don't think this is quite as compelling as some of the other mountaineering books I've read, there's a distance to the narrative that I feel glosses over the events and makes them more palatable. I think that hindered my enjoyment a little bit, as I feel like mountaineering tragedies shouldn't be very palatable. As a rock climber, but not a mountaineer, I feel like we know we are taking our lives in hand when we go out into wild places, and the possibility of injury and death are there. If/When they do happen, I don't think we need to distance ourselves from the terribleness of those events. The real horrors will hopefully keep those unprepared for this wilderness areas out of them, and will hopefully make those who wish to go get the proper training and skills. Mountaineering books are always a weird trade off because sometimes you tend to get stories from survivors (who were in the thick of things, but aren't always the best writers) or journalists (where the availability/strength of research plays a huge role). This falls into the second group. Hall's a very strong writer and he's done a great job pulling together stories and research, but there's a disconnect that's frustrating on a story level because no one caught in the storm survived and the bodies that were found, weren't particularly informative. There is some speculation about what may have happened, but given the information it largely is chalked up to 'Storm came, everyone froze.' This feels less like a cautionary tale than some of the other disaster stories I've read, but I think it's probably better for it. I read the Howard Snyder book about this climb in the 1970s and re-read it recently. (His brother was my 8th grade science teacher and Snyder told the broad story to our class one session.) It's a fascinating story and tragic.But thought it might be interesting to get another perspective - and one where more time has passed for investigation.Denali's Howl delivered this. There are major parts that are very similar to Snyder's book and some quotes are lifted verbatim (as well as photographs). But there is far more perspective available now and Hall interviews many of those involved in the climb and the rescue attempts after. Definitely worth the read. Of the two I probably prefer Snyder's book because it's quite fun to see through the eyes of someone who was there. I finished this book after getting back from Alaska; I sat in my favorite little corner in Powell's and knocked the whole thing out in a few hours. I found this book on a whim, and I was pretty glad I did. It was a well-written and engaging account of what turned out to be a nightmare for hikers on Denali. Although the book was about the tragic death of seven mountaineers, I learned a lot about the mountain and the national park. Andy Hall was the perfect person to write this book, given his relationship to the park and his father's involvement in the incident. More than anything, I've definitely found a new respect for Denali. The mountain is powerful, dangerous, and beautiful, and needs to be respected as such. A unique take on a compelling storyVery well written, researched and sourced. Hall's point of view also gives the story a credible but surreal and haunting quality. He keeps a healthy objectivity about his explanation of events, conversations, and facts, but his connection to the story brings a sense of somber appreciation to his analysis, which comes across earnestly to the reader. I do wonder if the mysteries have been solved or any more questions answered in the years since this book's release. Thanks to Andy for telling this tragic story in such a compelling but respectful fashion. First let me say that this fantasy loving reader has just read 2 nonfiction books in a month! That being said I learned a lot about mountain climbing from this book. I would not want to do it but it was fascinating. Going into the book you know that 7 guys die on Denali. What you don't know is how much this tragedy gets under your skin. It was just so horrific and heartbreaking. The author did an amazing amount of research and does a fantastic job of writing this as a narrative without starting to sound like he's just speculating. What I mean to say is that he doesn't take liberties. It's a very raw look at a very sad tragedy. 3.75 stars because I like decimals. This was a good, quick read about a climbing party that got stuck high up on Denali in the mother of all storms. It lasted for seven days and by the end 7 of the climbers died. The writing is okay, nothing special, the story is okay, perhaps if the author had delved more into the backgrounds of the climbers the reader would find them more sympathetic. As it is, they are more like cardboard characters because the reader doesn't really know much about them. One of my hobbies is reading books like this, so I enjoyed it, but its not as good as, for instance, "Into Thin Air" by Jon Krakauer. I listened to this as an audiobook, and really enjoyed it. Given my learning style, it would have helped to be able to see the names to keep all the climbers straight, not to mention the people in the rescue team, those associated with the park, and others involved in the event. But with all that, it was a really interesting story, especially from the author's point of view -- parts he came back to at the end were extra intriguing in this light. Denali's Howl is a compelling and well-crafted description of the deadly 1967 expedition to the summit. Andy Hall was 5 years old when it happened, and his father was the Park Superintendent in charge of the park and pieces of the rescue - so his personal connection to the events, and his ability to combine interviews and records, makes this a fascinating story about the dangers of mountaineering. A friend just got back from an Alaska vacation and when I saw this in my recommendations I decided to give it a shot. Essentially another mountain beats man, but I did enjoy the narrator. The audio book kept my attention. If you liked "Into Thin Air" then chances are you would enjoy this too. I ended up listening to this in one night because I was dying to know who the hiker was that the ranger's son meets in the first chapter LOL! The 1967 Wilcox expedition to the summit of Denali (Mt. McKinley) was the most deadly in the mountain's history. This book tells the story of the expedition, giving us insight into who the men were that journeyed up the mountain, what challenges they faced, and ultimately what probably happened to those who didn't make it back. It's a compelling book, adequately written, with lots of great details and research. Well worth a read. Andy Hall - Lifelong Alaskan Andy Hall is the author Denali’s Howl, The Deadliest Climbing Disaster on America's Wildest Peak, a non-fiction account of the tragic 1967 Wilcox Expedition. Andy lived in Mount McKinley National Park as a child; his father was superintendent there when the accident occurred. Andy holds a bachelor’s degree in journalism from the University of Alaska Anchorage, and has enjoyed a long career in Alaska as writer and editor, working at several small newspapers and for 16 years as editor and publisher of Alaska magazine and general manager of The Milepost. In addition being an author, he is a commercial salmon fisherman in Cook Inlet and a ski coach at Chugiak High School. He lives in Chugiak Alaska with his wife, Melissa DeVaughn, and their two children, Roan and Reilly.